We carry them with us every day. They represent trust; they represent secrets. Significantly, they hold the power to open doors, be they physical, metaphysical or metaphorical: the possibility of liberation. And for some, they provide an endless source of fascination. “It’s a challenge to absorb it all,” muses Lenore Lyons, artist and art educator, as she ponders the scope and scale of her ever-growing brainchild. Consisting of more than 2,000 individual artworks, “The Key Idea” is a community art project a year in the making. 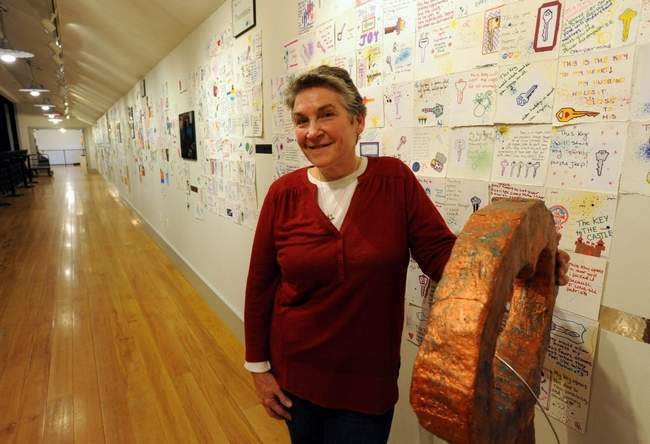 The project, which was at Cotuit Center for the Arts earlier this month and now has pieces at Barnstable Town Hall, is part of the larger exhibition “Keys: Connecting,” which features key-themed displays and related contributions in sculpture, video and painting. A smaller satellite exhibition, featuring approximately 300 selected works from “The Key Idea,” can be seen through Dec. 31 at the Town Hall Hearing Room in Hyannis. According to Lyons, the act of mounting the exhibition transformed the project from a collection of images into a coherent and revealing portrait of the hopes and dreams of a community. With images displayed in small groups, in age order, the journey through various life-stages provides a natural arc for the viewer, emerging as a secondary theme of the exhibition. A video by Dutch filmmaker Jeroen Wolf helps to put it all into context – in his two-minute video, childhood lasts barely 20 seconds. To Lyons’ surprise, she found that while young children write about gold and treasure, adults rarely write about money, even those coming from the poorest communities: “When you only have one thing to write about, for adults, it’s not money.” The exhibition reveals a range of interests and values, but according to Lyons, certain themes come through as dominant, - especially love. “They write about things that matter” she says. Lyons cites Cape Cod and Islands Art Educators as “really instrumental in reaching lots of children.” Every district from Provincetown to Bourne had at least one school participating, and students at Dennis-Yarmouth Regional High School took a unique approach and worked in groups to create the large mixed-media sculptures included in the show. The artist went to lengths to include those who “need to have their voices heard,” approaching organizations that work with disenfranchised populations, including NOAH, Bridge to Hope and the Robert F. Kennedy Children’s Action Corp. The primary criteria for selection was legibility, with 2,000 of 2,500 submitted works on show. Also included in “Keys: Connecting” are three related project by Lyons: “The Art Journal Project,” the interactive “Keystone Project” and a set of square encaustic works using paint made with melted beeswax and resin, and inspired by the “The Key Idea.” Visitors are invited to contribute their own work to “The Key Idea,” so you might just find yourself becoming a part of project in future incarnations. As for the future? “People keep asking, where is it going next?” At present, Lyons is considering compiling 300 or so pieces into a book, as well as expanding to other states and possibly other countries. She even mentions The Smithsonian as a possible venue.